TO: Everyone who helped make the holidays brighter for area families in need. This year, the Giving Tree program provided gifts for 119 children and 125 residents at the Pristine and Woodland Manor nursing homes. TO: The TKE Fraternity and the Kappa Alpha Theta Sorority who helped provide gifts. FOR: The generous monetary donations that were used to help cover the cost of gifts that have to be purchased when gifts are not returned. Any additional funds will be donated to help support the Backpack Program. TO: The numerous volunteers who helped with ornament writing, donating, organizing, packing and delivering the gifts. Your continued support through the upcoming year is greatly appreciated! Every year, St. Mary’s provides a list of area families who are in need of help during the holiday season and offers a “Giving Tree” to help meet their needs. By selecting an ornament from the tree, purchase & wrap the gift & return to the tree or the parish office. Help is needed to sort the gifts in the parish center AND deliver the gifts to the families after the morning Masses. 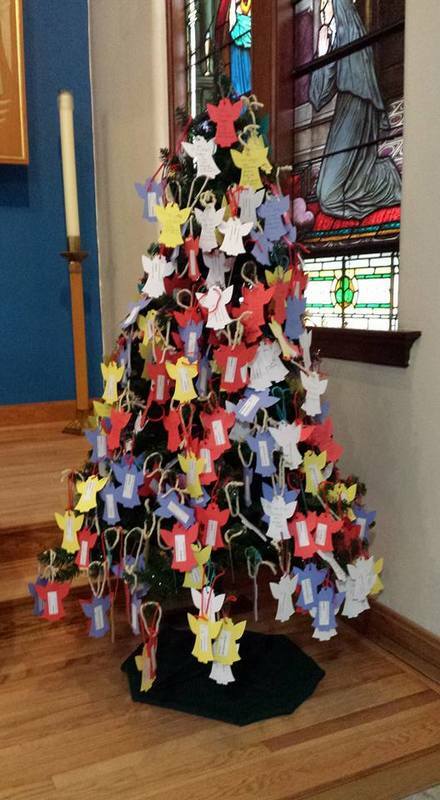 As many parishioners know, the Giving Tree has provided gifts to children and seniors for many years. We had an incredible team of leaders for many, many years. New people bring new ideas and improvements to our program. Please pray about and consider your willingness to give of your time as the Giving Tree apprentice elf. Please email Shelagh at shelaghmoul@gmail.com.